EMERYVILLE, Calif.--(BUSINESS WIRE)--Today, Equal Pay Day, LUNA Bar steps up with a donation to the players of the U.S. Women’s National Team (USWNT), closing a key gap between their 2019 World Cup compensation and the players on the U.S. Men’s National Team. Believing in equal pay for equal work, LUNA Bar is giving each of the 23 women named to the 2019 USWNT World Cup team $31,250, comprising the difference between the women’s and men’s World Cup roster bonus. In 2016, the players of the USWNT made history when they demanded equal pay. Their fight continues today, as several inequalities remain, such as the World Cup roster bonus awarded to any U.S. soccer player, woman or man, named to the World Cup team. In 2019, each USWNT player was set to receive $31,250 LESS than their counterparts on the men’s team—until now. LUNA Bar has partnered with the U.S. Women’s National Team Player’s Association (USWNTPA) to make its donation directly to each of the 23 players. All women deserve equal pay for equal work, whether working in an office or playing soccer on a global stage. By making their experience public, the players of the USWNT became advocates, mentors and role models. This Equal Pay Day, LUNA Bar is providing advice, support and inspiration to help women ask, prepare and negotiate for their own well-deserved equal pay. 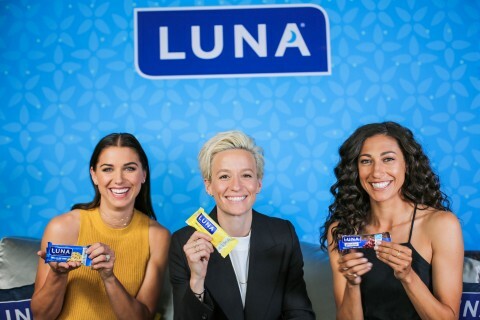 Visit Lunabar.com to hear from expert voices including USWNTPA Executive Director Becca Roux; current USWNT Player Christen Press; and USWNT Alumni and ESPN Contributor Julie Foudy. Since 1999, LUNA Bar has always stood for more than just nutritious food. With a strong heritage of supporting women, LUNA Bar has supported important causes that women care about, like equal pay and women in film. LUNA Bar champions change and demands that women’s equality be a right, not an option. LUNA® Bar and LUNA® Protein are non-GMO, gluten free and made with organic ingredients, such as organic oats. Available in 17 delicious flavors, LUNA Bar and LUNA Protein can be found at a variety of natural, specialty and traditional grocers and online at lunabar.com. Follow LUNA Bar on Facebook, Instagram and Twitter. The USWNTPA serves as a leading advocate for women’s soccer players, pioneering a new era of women’s soccer as a preeminent sport. The primary mission of the USWNTPA is to protect the rights of USWNT players and to advance the economic and social well-being of all USWNT players, both on and off the field. The USWNTPA is committed to raising the level of women’s soccer domestically and continuing to grow the game worldwide.